Our Certified Strength and Conditioning Specialist created workouts for your hotel room, an open field, or minimal hotel gym. Brad is a drug-free competitive bodybuilder, has earned his Master's degree in Kinesiology, is a member of the Air National Guard and is a cancer survivor. Being on the road is tough enough and trying to get an effective workout while you’re away for work or play is often a bridge too far. We all want to mimic our at-home training style as much as possible – same weights, equipment, and environment. But it never works out that way. We either scour the nearby fitness centers feverishly looking for one to fit our criteria or we just throw out the idea altogether and vow to get back on the proverbial horse when we return to our home base. Well, it’s time to stop using travel and crummy hotel gyms as an excuse. The workouts shouldn’t stop just because you’re outside your familiar, comfortable surroundings. Instead, it’s time to adapt and flex your creative muscle. With a little ingenuity and imagination, you can easily modify any setting into your very own gym. And you’ll be glad you did for a whole range of reasons. Like this weekend bag? It's only $40! Hotel stays tempt us to eat poorly (many restaurants to choose from), get lazy (the first thing you see in your room is the bed) and participate in group outings (that may include alcohol and late nights). But there are many benefits to participating in just a little activity. First, on-the-road workouts spur metabolism and help you avoid travel-related weight gain and loss of lean muscle. Second, studies have shown exercise can help you beat jet lag. Third, travel will wreak havoc on your need for normalcy and routine. Add interrupted sleep schedules and unpredictable meal times and you have a great reason to crave a little predictability. Make your morning active routine the anchor for the rest of your day. Thankfully, you don’t need a fully-equipped elite fitness center to stay active while away. 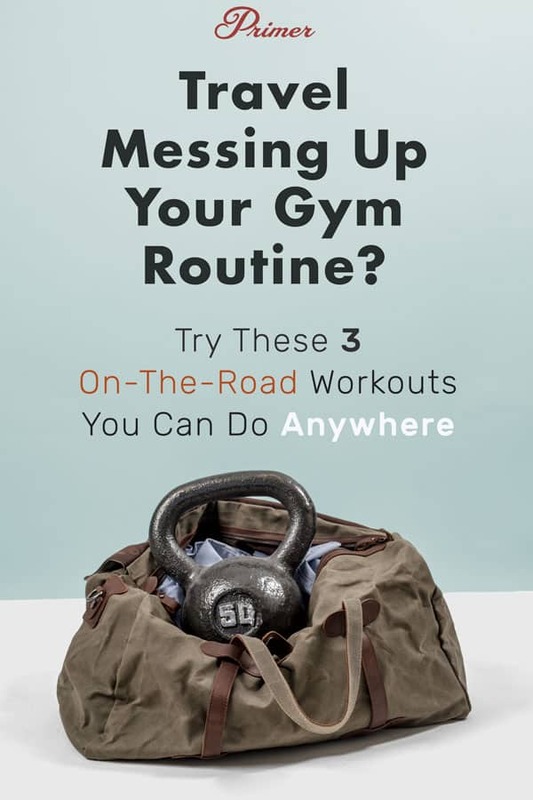 Here are three full workouts you can deploy pretty much anywhere, any time to workout on the road. These are designed to be simple, effective, modular sessions to start your day, not intense, muscle-building sessions. The important thing: do them. Maintenance is OK when you’re away – as long as you keep moving. Many hotels are equipped with at least a moderately stocked fitness room. You’ll usually find dumbbells, treadmills, bikes and a few universal machines at your disposal. This workout includes exercises using a few dumbbells combined with some bodyweight exercises. The Warm Up: Treadmill for five minutes at a brisk pace. If floor push-ups are not challenging enough place your feet on a bench or chair while keeping your body perfectly inline. Descend into the bottom position resisting the urge to drop your hips toward the floor – keep a rigid and braced midsection. Reverse the motion without locking your elbows at the top position. Place your feet a little wider than hip width with your toes pointed slightly out. Put your hands behind your head and squat down pushing your hips back and down as you descend keeping your knees in line with your toes. Reverse the action without locking your knees at the top. Assume a pushup position on the floor while gripping your hands around a pair of dumbbells. Perform a pushup. Once you reach the top position perform a row with your left side by pulling the dumbbell to your side while balancing on the other hand. Return the dumbbell to the floor and perform another pushup and repeat the row with your right side. Keep alternating until you hit your rep goal. 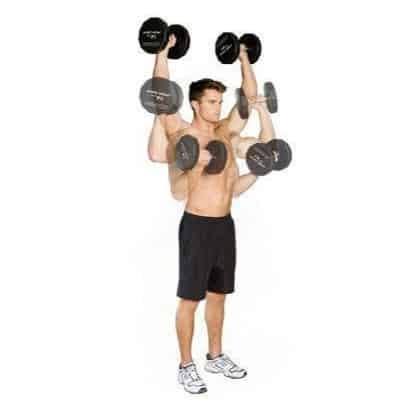 Holding a pair of dumbbells (can be optional) stand with your feet about shoulder width apart. Start the motion by stepping back with one foot while lowering your body so that your front leg forms a 90 degree angle. With your rear knee just short of touching the floor return to the forward starting position and alternate legs. 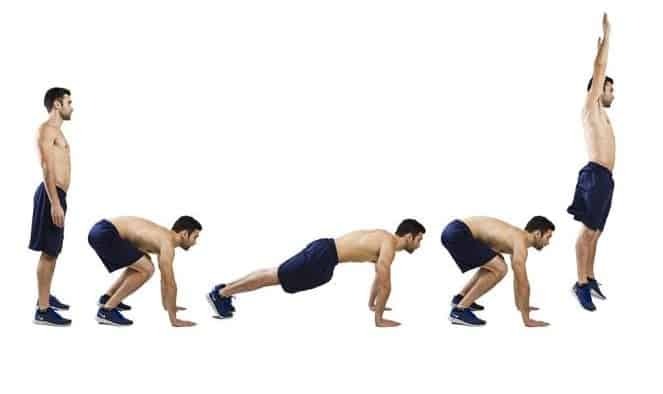 Assume a pushup position but with one leg bent forward under your body as if you are in a running stance with your feet. Slightly launch your lower body up and switch legs as you bring the forward leg back and the back leg forward simultaneously. Continue this motion for all reps. Stand with a dumbbell in each hand by your sides. Curl the weights up to your shoulders then rotate your elbows out and press the weight overhead. Reverse the motion with the dumbbells ending by your sides once again. Lie on the floor with your knees bent at 90 degrees. With your hands crossed over on your chest raise your shoulders off the floor while keeping your lower back in contact with the floor at all times. Crunch up by curling your upper body toward your legs for a contraction. Lower back down without resting your midsection. For those days when you have a full load of meetings or a vacation to get to, performing a little something in the comfort and convenience of your hotel room is a no-brainer. Advantages include zero commute time and no need to dress for a public place! 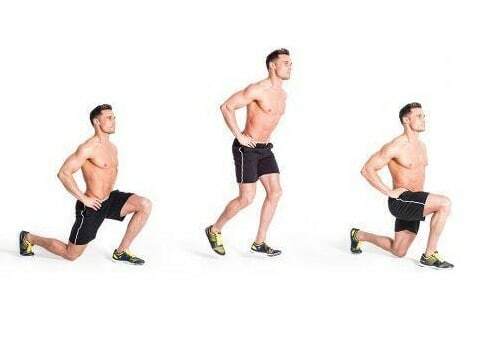 The Circuit: 3 to 5 rounds of 10-15 reps each exercise + 3 sets jumping jacks for 30 seconds each. 30 seconds rest between rounds. When you elevate your feet you transfer more of your bodyweight to your upper body, making the exercise more challenging. If you find elevated or floor pushups too challenging to hit your rep goals, simply place your hands on a chair or the bed and elevate your upper body so that more weight is transferred to your legs. Much like the reverse lunge, stand with your feet about shoulder width apart and hold a pair of dumbbells, water jugs, or luggage to your sides. Lunge with one foot forward until your forward knee forms a 90 degree angle. Push back up to the starting position and alternate with your other leg. Find a stable chair (preferably one without wheels!). Sit on the edge of the chair gripping the edge with both hands by your sides. Place your feet either on the hotel bed or another chair or on the floor. You should be suspended by your arms and your body forming an “L” shape. Lower your body by your arms and dip down toward the floor. Form a 90 degree angle at your elbows and then return to the top position without locking your elbow joints. Lie on the floor and raise up on your glutes with your upper torso and legs slightly off the floor. You can use your hands to help stabilize if necessary. Simultaneously crunch your upper body and knees together and feel an intense contraction in your abs. Return to the lower position without touching your legs or upper torso to the floor. Place a leg on a bed or stable chair around two feet behind you, facing away. Your forward leg should be slightly in front of the rest of your body. While staying tall and straight, squat down with the forward leg until it achieves a 90 degree angle and with your trailing leg resting on the chair or bed. Press back up without locking your knee. Complete all reps for that leg before switching. Lie on the floor with your hands under your glutes to support your lower back. Tuck your chin into your chest and raise your legs a few inches off the floor while keeping them straight. Raise one leg and begin to alternate small straight leg kicks with a moderate pace. Be sure to keep your feet off of the ground at all times. For those of you who are lucky enough to reap the rewards of good weather and have a beach or park nearby you’ll easily able to get in a great workout while getting outside and taking in the fresh air. The world is your playground. Stand in an upright position and then bend at your knees and place your palms flat on the ground. Kick your legs out behind you so that you end up in a pushup position. 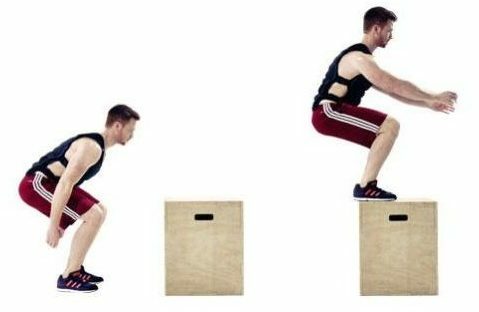 Immediately after, kick your legs back up toward your waist in a squatting position and then stand tall and jump in one motion. That is one rep.
As with forward lunges, the walking option will have you lunge forward without coming back to the starting position. Instead you’ll bring your trailing leg forward and cycle it to take the next step. Instead of pressing all the way up as with a traditional pushup you will stop half way up, descend back down and then go to full extension. Each one-and-a-half plus full rep counts as one complete rep. Stand in front of a box or stable bench. While deriving power from your hips and legs, explode off the floor squarely onto the box or bench. Try to avoid catching the edge of the box with your toes. Land with your entire foot on top of the box or bench. Sit on the edge of a bench gripping the edge with both hands by your sides. Place your feet either on another bench or on the ground. You should be suspended by your arms and your body forming an “L” shape. Lower your body by your arms and dip down toward the floor. Form a 90 degree angle at your elbows and then return to the top position without locking your elbow joints. Assume a pushup position but on your elbows. Brace your core as you maintain a rigid form from head to toe for 20 to 30 seconds. Laying on your back, place your hands behind your head and alternate touching your elbow to opposite knee (right elbow to left knee). Alternate to the other elbow and knee and continue in a controlled manner for the target reps. Be wary of crabs (on a beach) or dog poo (in a park). As I mentioned, these circuits are designed for one thing: get you up and moving during your time away and, crucially, maintenance your fitness. If they’re not difficult enough string each circuit together in one monster routine. If you struggle to complete 3 rounds, keep at it – you’re actually growing your fitness while on the road. Being on the road doesn’t mean putting your fitness on the back burner. Sure, you’ll most likely not break any personal records training in your hotel room but you’ll guarantee you’re never without some form of training routine. What is your go-to travel workout? Let us know in the comments below! Sworkit is a great app for bodyweight workouts when traveling. You can select upper, lower, or full body workouts and the time you have and the app guides you through the workout. Ready to invest the time and money into raw denim? We'll get you started. 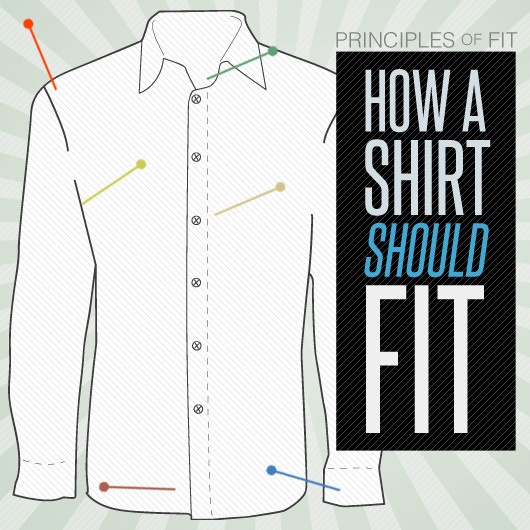 Covering almost a half of your body, the fit of your shirt is paramount for looking your best. We break it down from neck to waist.